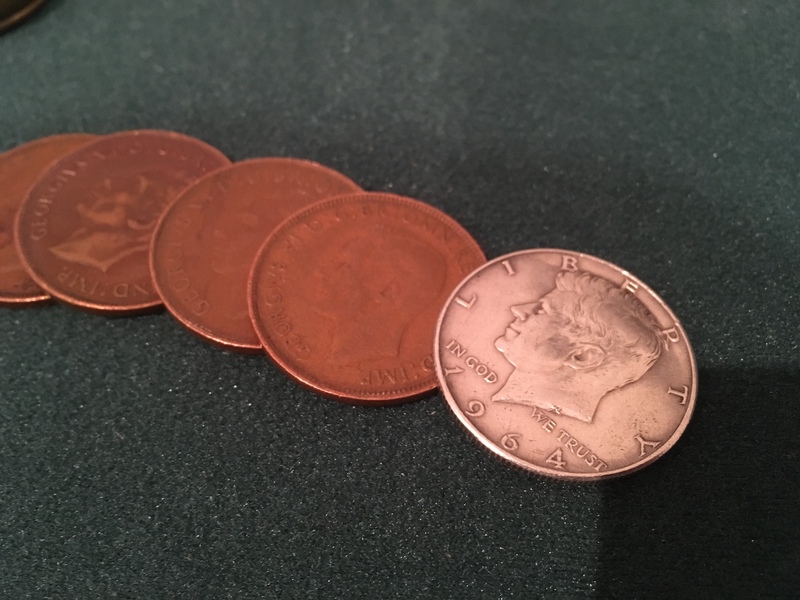 Is there a cheap way to buy the half-dollar sized English penny that's often used for coin effects? And what about that Chinese coin with a hole in it that came with my C/S/B kit? Considering that at least one of those coins isn't even real, and I'm not looking for anything gaffed, it seems like there should be an inexpensive way to buy them. 120 1 inch coins for $9.99 They'd make great givaways. If they're similar in size to a quarter, you could do a quick Spellbound routine and give away the Chinese coin. Thanks so much Mike! You read my mind: I also wanted these for Spellbound. I hadn't thought about giving them away, but now that you mention it, I like that idea! Btw, it looks like the Chinese coins are indeed the same size as a quarter (to within a mm). I've been working on Spellbound with a half dollar, but maybe I'll switch to a quarter. British pennies are 2 cm in diameter whereas American half dollars are 3 cm. Hmmm... if I want to use a half dollar for Spellbound, what similarly-sized coin could it turn into? I bought a set (10) of steel US Morgan dollar replicas on eBay for about $10 a year ago. They are nice replicas, about the same size, milled on the edges and great for magic tricks. There's this page on ebay. Some of the prices are pretty good. Looks like the prices on a couple of the magic shop websites are running around $2.50 for pennies. That seems high. While we're on the topic, what coins do you guys usually use for Spellbound? I am trying to learn David Roth's Spellbound routine (from his Expert Coin dvds). I like the idea of using a half dollar and a Chinese coin but: 1) It's apparently tough to find cheap half-dollar sized Chinese coins, and 2) the hole in the coin actually exposes one of the sleights if you're not careful. I don't perform Spellbound - no confidence in myself, but I have practiced/played around with it for years. 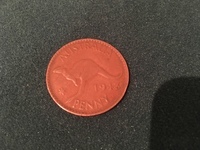 I prefer the contrast of a Chinese coin to that of an English penny and have ever since I saw Dan Garrett perform his American Ninja Spellbound decades ago. the Penny you are looking for is the so called ‚old english Penny‘. It has a diameter of 3 cm and is perfect for spellbound. In all the books about coin magic they talk about those pennys. There’s nothing so-called about the "old" English Penny. That’s exactly what it is. I have more than several of these and also more than several copper/silver coins. Of course there pennies even older than these old pennies. The copper/silver are English penny one side, US half dollar on the other other. As noted by Clemens Ilgner these are a perfect match. Great for any number of routines. The eternal challenge is to justify using coins that are not in circulation. In the UK that applies to both half dollar and the old penny. It’s not difficult, it’s just something to think about. Folk like me who were brought up in the pre-decimal era call the "new" coinage, new penny or pennies. And will continue to do so. I usually refer to the English penny as "real money and not the toytown stuff we use today". Checking at the link provided by Mike, the coins look like the new penny. There may be an old penny or two in there, but I don’t think so. These new/current coins are smaller than the half dollar and old penny. So, if you need, say, four old pennies and buy one of these lucky dips, you might not get four of a kind. At the price it’s probably worth risking a couple of bags. The Tatuo coins on Mike’s second link look inviting. The Olde World English coins are relatively easy to find over here, but they’re getting more and more expensive as time rolls on. See here. Most of my pennies are 1967; the half-dollars are early eighties, though I think I’ve got a few sixties mint somewhere. The second item on this link is a copper/silver. No disparity with the size. 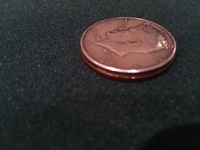 The standard English penny used in the C/S coin is a tad bigger than the half dollar. You have to be careful with an expanded half dollar shell. It doesn't fit an English penny and almost fits a C/S coin but gets stuck. BEWARE! At least this is my experience with the expanded shell and the EP and C/S. That is exactely what I wanted to say. Due to the reason that english is not my main language I could it not explain better. 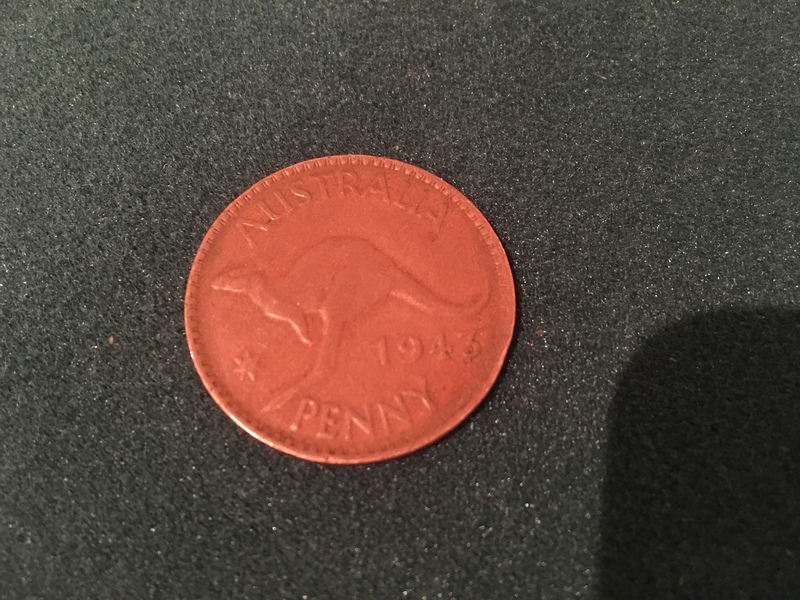 I use 1943 Australian Pennys since I saw them in a lecture by Johnny Thompson. That's what I thought, and you did get the size thing right, which is the important thing. My el cheapo Chinese coins came in from Amazon today. 120 coins for $10. They're almost exactly the size of a quarter - just a tiny bit bigger. They're very thin and cheap feeling. But for a quick Spellbound after which you give away the coin, they're ideal. Borrow a quarter, turn it into a Chinese coin and give back the Chinese coin. You've tripled your money! Do you think these el cheapo's would work well for Charming Chinese Challenge? I also saw these, but don't know how many coins you actually need for the effect (waiting for it). Also, by "similar in size" to a quarter, do they tend to be bigger or smaller? I'm thinking they might work well for Chinese Hole? I don't think the el cheapos would work well with Charming Chinese Challenge. They're pretty small and very light weight. But I don't do CCC, so I can't be sure. They are slightly larger in diameter than a quarter, but close enough for a spellbound. Not sure what Chinese Hole is?? Those coins look like "white metal", Mike. Very thin and they snap real easy. I like the Tango brass half dollar size Chinese coins. Last time I bought some a couple years ago they were $12 each but very sturdy. For copper I like the Australian pennies but the best price I found was $5 or 6 each. Irish pennies are also nice and only cost me $2.50 each. Tim - You're right about the cheapness of the coins. But that's why I bought them. They're going to be give-a-ways. They cost about 10 cents each. 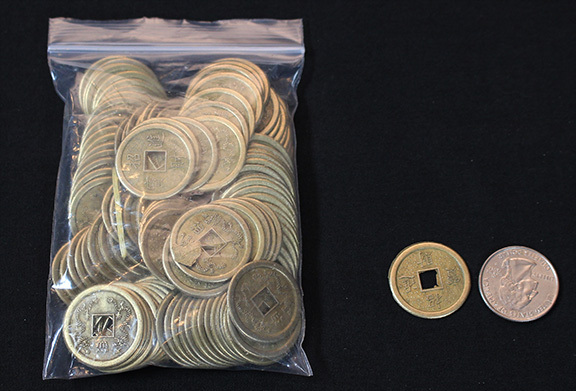 I just got my Chinese coins in the mail... and holy cow are these some flimsy coins. I was expecting this and I am also going to use them as give-aways, but first I have to get use to doing the moves will something almost as light as air! Hi SpareTopChange - yes, they are "EL CHEAPO" for sure. Maybe they're light enough to levitate with IT!! Spellbound is more difficult with quarter sized coins. But the give-away feature makes some routine using the El Cheapos worth doing. I'll bet a click pass won't be deceptive with these! 2. Spellbound is much more difficult with quarter-sized coins and doesn't really look as good anyway. I'm starting to think that if I really want to use Mike's idea of giving the spectator one of the coins at the end, I should instead use half-dollar sized coins and give the person an actual half dollar! Tom Ladshaw has a bunch of coins available on his site. Go to a coin shop ask about their junk coins. Finally found a use for the "el cheapo" quarter size Chinese coins - I do a "bit coin" bit i.e. use a bite-out quarter. After "spitting" the bitten piece back onto the coin, I do a spellbound change to the chinese coin and give it away. Still looking for a good tie in from the bite-out to the Chinese. The notion of "Bitcoin" is perfect for the bite-out sequence. But what's the rational for changing to a Chinese coin? Any thoughts? This. Also, if you are looking for Walking Liberty, Barbers, Franklins, 1964 Kennedy's, etc. don't look at the ones sold in the paper sleeves. Those are typically more valuable due to condition, date (scarcity), etc. Ask them if you can look through their "bulk" silver coins. Some stores call them culls, some have other names for them. But these are coins sold solely on the basis of silver content. So a silver dollar will generally run you a little less than what the price of silver is per oz. on that day. Some shops won't sell them individually that way I suppose, wanting you to buy a large bag of coins, but all of the ones I've frequented did.